The third participant in the MagMods essay club is Matt Huculak, a Postdoctoral Fellow at Dalhousie University and Editing Modernism in Canada (EMiC). His current research examines “the review” as both a literary artefact (a magazine) and as a modernist practice of cultural mediation (“reviewing”)—a site of exchange between elite moderns and the reading public. 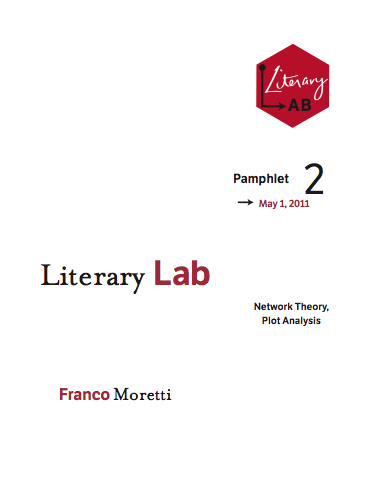 I want to focus on Franco Moretti’s “Network Theory, Plot Analysis” and how it could potentially translate into the theorization of modernist periodical networks. First, I must note (and admit jealousy) that Moretti is working within a rigorous, well-defined space of theorization: the play Hamlet. That is, he has a set of solid data from which to work. Our first problem in the field of modernist periodicals (as noted by Scholes and Wulfman in Modernism in the Magazines) is that no such dataset exists for us. The Modernist Periodicals Database will be an attempt to rectify that situation, but even if it is successful, we are years (perhaps even a decade) away from completing an accurate and “stable” dataset from which to work. Thus, my first question for Dr. Moretti is how useful is this type of network analysis when the network is still being mapped? It seems to me that if we wish to engage in the type of network analysis Moretti theorizes here, we must create our own fixed “stage” where we can place major players of the field. For example, we might begin two separate projects of analysis: one focused on New York (U.S.) and one focused on London (U.K.). That is, if we do not create an accurate database of the major players of periodical production, we run the risk of creating network analyses that do not take in to account a figure like Horatio. For example, in London, we can easily claim J. C. Squire and T. S. Eliot as representative figures of modernist periodical production (our Claudius and Hamlet, if I may). But what happens if we have lost the names of the “minor” characters? What happens if our stage might reach across the entire English-speaking world (or at least the commonwealth)? Moreover, a part of periodical studies is attempting to gauge the audience of a given periodical (or at least who the advertisers thought that audience was). We are now in a much more complicated space of implicit and explicit connections that are difficult to define or render. 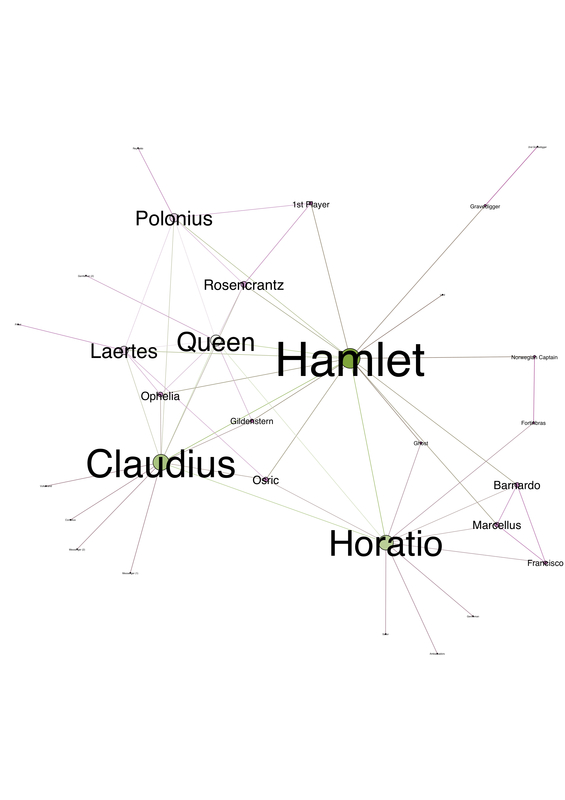 Moretti speaks of tracing “Interactions” between characters as a basis for theorizing Hamlet’s network. This seems like a nice way of describing the “interactions” between various periodicals, which may take the form of an “advertisement,” a “review,” an “editorial,” or a “letter.” With a solid dataset we could see how far Eliot’s influence reached in other periodicals in the form of advertisements or letters he wrote to other magazines (and vice versa). I wonder if Moretti has theorized a consistent lexicon that we can all use in attempting to describe network analysis that could describe both plays and magazines? That is, “interaction” is a beautiful word that can describe the speech between two characters as well as the advertisement of one periodical in another. Is there a dictionary of network analysis that we could start to build to codify these types of terms. The other problem facing us in terms of Moretti’s analysis is that we do not have a centre from which to work out of. We have no representative figure through which we can trace interactions. We have no “Hamlet” character. For our network analysis to work, would we have to set up a “protagonist” at first until we were able to map that larger field of periodical production through something the Modernist Periodicals Database? If so, what criteria would we use in the choosing of such a character. Would we then be making the mistake that network analysis potentially obviates: the opinion of the critic. If There are Two Swords…. Finally, I would to state that Moretti’s theorization depends not only in “interactions,” as he claims, but also on the idea of “conflict.” That is, something like Hamlet already exists within a sphere of poetic expectations (its plot line) and thus we are already aware of a line that can be traced. Can we say the same for modernist periodical production which consists of for more abortive plot lines than actual conclusions? What happens when the dataset is _random_ and the only logical “story” that can be told is one created by the critic? Where is our conflict in the story we are telling about modernist periodicals? Is it in the fight for survival in the literary market beholden to the logic of capitalism? It is in the fight for what the term “modernism” actually means? How do we know if we are simply watching the “Mousetrap” or the final sword fight. Does that matter in Moretti’s conception of network analysis and plot?